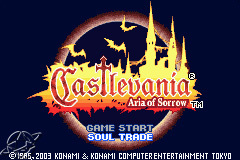 Castlevania Aria of Sorrow FAQ/Walkthrough. Castlevania: Aria of Sorrow FAQ/Walkthrough. In here continue going right until you get to a save point. Then exit the save point and go all the way left until you get to the water fountain. To the left of it should be a platform that goes up and down, get on that and take it up. Then go right and pick up the map. Then go up the platform in this screen and then go left to the next room. Now take the platform up to the next floor and go right to the next screen. Go right without falling down and go right to the next screen which will now warp you into the sky. Go right to the next tower, fighting the enemies you want. Again you can explore this new tower or just go right to the next tower. In here go right and when you can drop down do so. Then go left to gain access to another save point. Exit the save point, go back up, and this time go right. Now go left again and keep going left until you get to the next area. 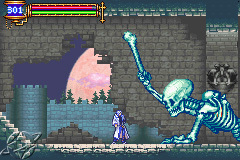 It wouldn't be a Castlevania game without Death, Dracula's close aside. For his first form you have to defeat his Scythe. He will fire little syphes at you, simply dodge them. He will do some major damage if you get hit by anything so be careful. His second form isn't so bad as long as you are ready for any move. When he is on the ground jump over him and always duck while attacking him. If he throws his Scythe be ready to jump over it before you see it on the screen because it comes fast. Once you beat him you will obtain his blue soul which fires Scythes in all directions. After you beat him go right and get the new ability which will allow you to now go into the water! Backtrack to the room where you last met Yoko. To the left of there was a place where you could sink in the water, go down there and go left first to the next room. In here go down and left to the next room. In here dodge the spikes by manuvering around them and sliding and go right to the next room. Go down and left to the next room. 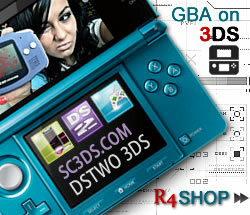 In here you will find some new cloths to really boost up your defense. (Press down and A to drop off of the boxes) Then backtrack until you have an intersection that you can go right on. Go in here and swing all the way right until you get the new sword. Go back and then go up to the spot where you first came in at. You can go back to save it or this time progress right to the next room. Keep going down until you reach an intersection. Go right and you will reach a warp point. Warp to the farthest left warp point. You can buy/sell items from Hammer or go right to the first save point. Exit there and it's time to go to the next stage by going all the way left.